Where will you watch the event? ESPN and Top Rank announced their first pay-per-view event under the Top Rank on ESPN banner. Two kings are set for the year’s most anticipated welterweight showdown when pound-for-pound king Terence “Bud” Crawford puts his WBO welterweight world title on the line against former unified 140-pound champion and the pride of Bolton, England, Amir “King” Khan, on Saturday, April 20, live on pay-per-view at 9 p.m. ET/ 6 p.m. PT. Details on how fans will be able to access the pay-per-view event will be announced at a later date. Programming and Scheduling, Burke Magnus. Crawford, from Omaha, Neb., is ranked by many experts as the world’s best fighter, a switch-hitting dynamo who has reigned supreme in three weight classes. He won the WBO lightweight world title on March 1, 2014 in Glasgow, Scotland, dethroning hometown hero Ricky Burns via unanimous decision. Crawford proved his lightweight supremacy that year with a thrilling ninth-round TKO win over then-undefeated Yuriorkis Gamboa and a near-shutout decision victory over Ray Beltran. Crawford made history when he unified all four 140-pound titles, punctuating his dominance over the division with a third-round knockout against Julius Indongo on Aug. 19, 2017. With nothing left to prove at 140 pounds, Crawford moved up to welterweight. In his first bout at the weight, he knocked out Manny Pacquiao conqueror Jeff “The Hornet” Horn in the ninth round to win the WBO crown. For his first welterweight title defense, Crawford returned home to the CHI Health Center Omaha and knocked out bitter rival Jose Benavidez Jr. in the 12th round in front of 13,323 passionate fans. Khan (33-4, 20 KOs) burst into the public consciousness at the 2004 Summer Olympics in Athens when, at 17 years of age, he captured a silver medal for Great Britain. He won the WBA super lightweight world title on July 18, 2009, outclassing Andreas Kotelnik to win a unanimous decision. He made five successful title defenses at 140 pounds and became unified champion when he knocked out IBF ruler Zab Judah in five rounds in 2011. Khan has won seven of eight bouts since December 2012, the lone blemish coming when he moved up in weight to fight middleweight world champion Canelo Álvarez. After boxing well in the early rounds, Khan was knocked out with an overhand right in the sixth round. Following the Álvarez defeat, Khan took a nearly two-year sabbatical from the ring, returning in 2018 with a vengeance. In April, he blasted out Phil Lo Greco in 39 seconds, and in September, he notched a wide 12-round points victory over perennial contender Samuel Vargas. More than 13 years since turning professional, Khan will take on the pound-for-pound king in a legacy-defining superfight. For more information visit: www.toprank.com, www.espn.com/boxing; Facebook:facebook.com/trboxing; Twitter: twitter.com/trboxing. 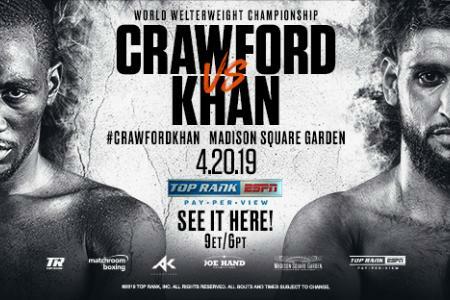 Use the hashtag #CrawfordKhan to join the conversation on social media.